Throw Away Your Tops & Tees - Try These AWESOME Shirts Instead! If we were to choose one fashion item we could spend our lives in (apart from our jammies), it would definitely be the ever-stylish shirt! Well, you can’t blame us, fashion trends can come and go, but the good old shirt will always help you look on-point. They are just so versatile and can be dressed up or down the way you want to. And, not to forget how comfortable they are. 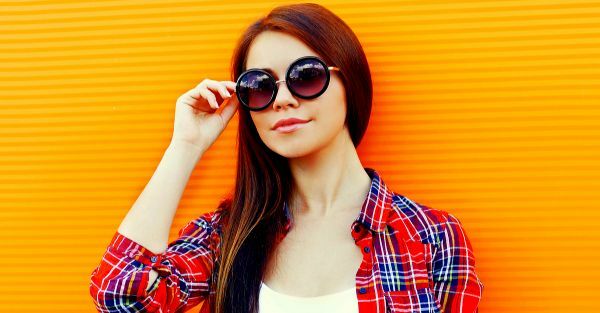 So we found 15 shirts for women under Rs 1,000 that will totally change your dressing game! We bet, you want them all! Love us right? We love you too! 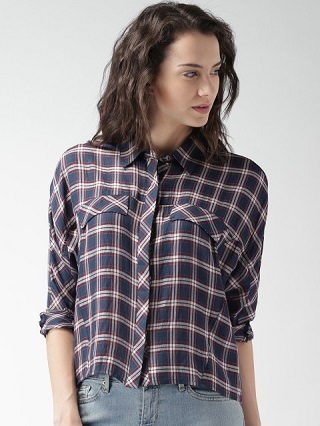 There is something so cool about plaid, it’s no wonder it’s been around for so long. Brighten up your style by slipping into this classic shirt, it will never fail you. Price: Rs 999. Buy it here. Slay the art of simple (yet cool) dressing in this shirt tunic with contrasting floral panels on the sides. The powder blue colour is so soothing, we are loving it! Price: Rs 999. Buy it here. Be a vintage babe in this pretty, peach polka dot shirt from Myntra. Rock the shirt with a cute skater skirt in a bright colour and platforms for a feminine look. Price: Rs 599. Buy it here. We are absolutely loving this long shirt featuring a mandarin collar and vertical stripes. Team it up with a pair of baggy jeans, heels and a bold lip for an edgy, hot look. Price: Rs 539. Buy it here. 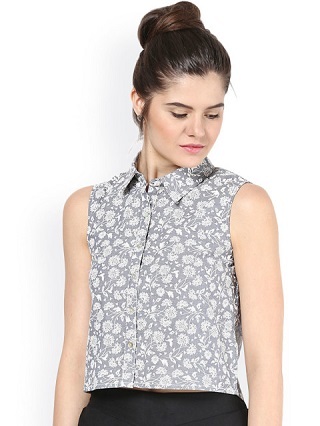 Bloom with prettiness in this feminine, flirty shirt. Featuring a bold floral print, this shirt will look amazing paired up with black pants and heels for a formal look and with a skirt and flats for a cute, casual look. Price: Rs 594. Buy it here. This shirt is perfect for the days when you are standing clueless in front of your wardrobe. You can just throw it over a pair of jeans and look super cool and casual! Price: Rs 779. Buy it here. 7. Basics Be The Boss! A white shirt is a must have in any girl’s wardrobe. It is the most versatile piece a woman can own. Button it till the top and layer a statement necklace on top for some serious style points. Price: Rs 847. Buy it here. Love chocolate? We bet, you will love this too. Show off your sophisticated side in this gorgeous shirt featuring a bold striped print. We just love the colour, it’s so different. Price: Rs 993. Buy it here. We fell in love the moment we saw this sleeveless striped shirt. It is so simple and classy that you would want to wear it every day. Price: Rs 615. Buy it here. Win the fashion game with this oh-so-chic shirt from Only. 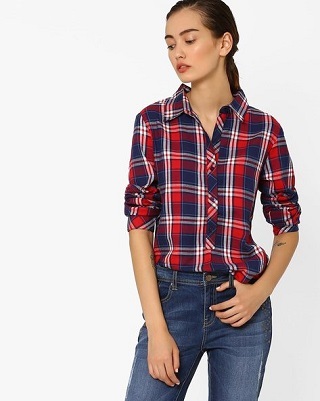 Featuring a cool check print and full sleeves, this shirt will give you the liberty to pair it with anything from leggings to shorts and dress it up or down for every occasion. Price: 747. Buy it here. 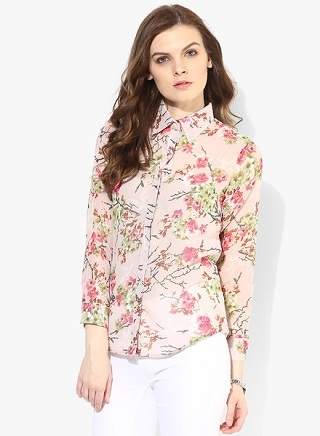 Look all dolled up in this pretty floral print full sleeved shirt. It is perfect for days when you are in a fashion rut. Just throw it on over a pair of jeans, swipe on some pink lipstick and you’ll be good to go. Price: Rs 700. Buy it here. What’s that one thing that never goes out of fashion? No guesses required! It’s denim. 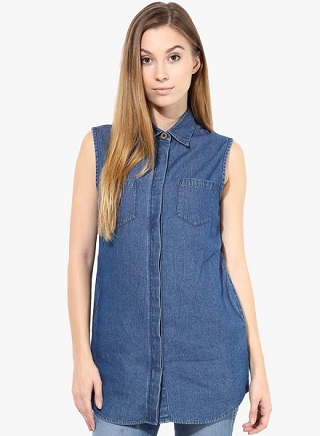 So, we have found this denim shirt for you that is versatile and will always look stylish. And the best part? The price! Can it get any better? Price: Rs 699. Buy it here. 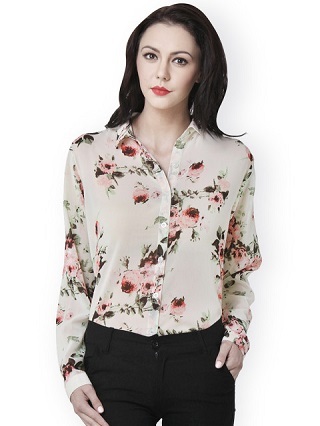 This blush shirt blouse from Stalk Buy Love is pure love. So pretty and feminine, you will totally look like a diva in this! Price: Rs 999. Buy it here. 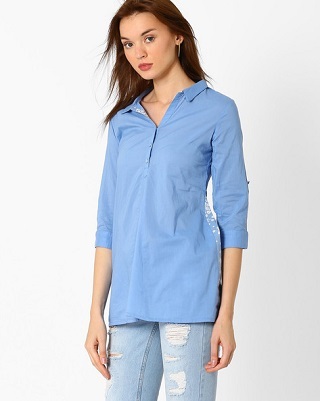 Look like a total chic chick in this powder blue shirt. Tuck it into high-waist pants or a skirt to look super smart and classy. Price: Rs 649. Buy it here. Channel your inner sass queen in this cropped shirt featuring a subtle floral print. Wear your hair in a messy bun for a super cute style.